Forest Rd (C414) looking north from the junction with Logan Rd/Sawpit Hill Rd (C413). Source: Peter Renshaw, July 2007. 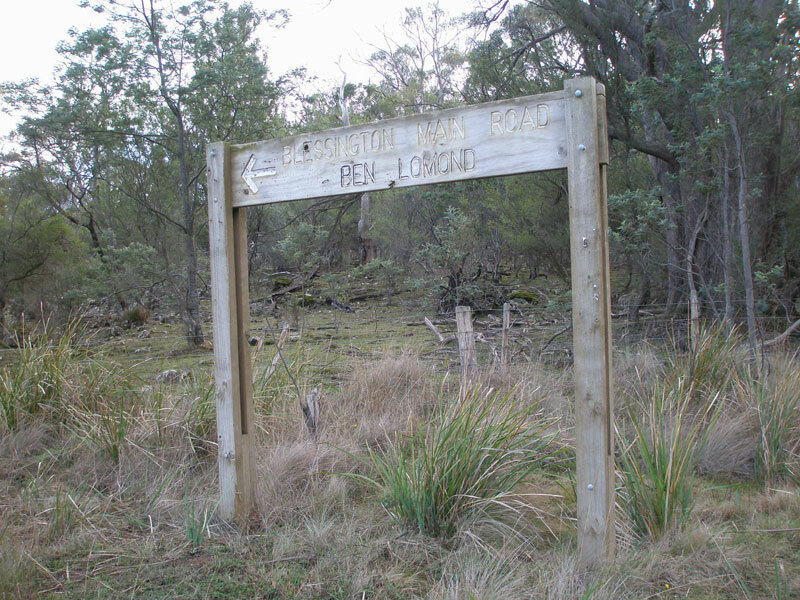 Southern Terminus: Logan Rd (C413) & Sawpit Hill Rd (C413) & Forest Rd (C414), 12km east of Evandale. 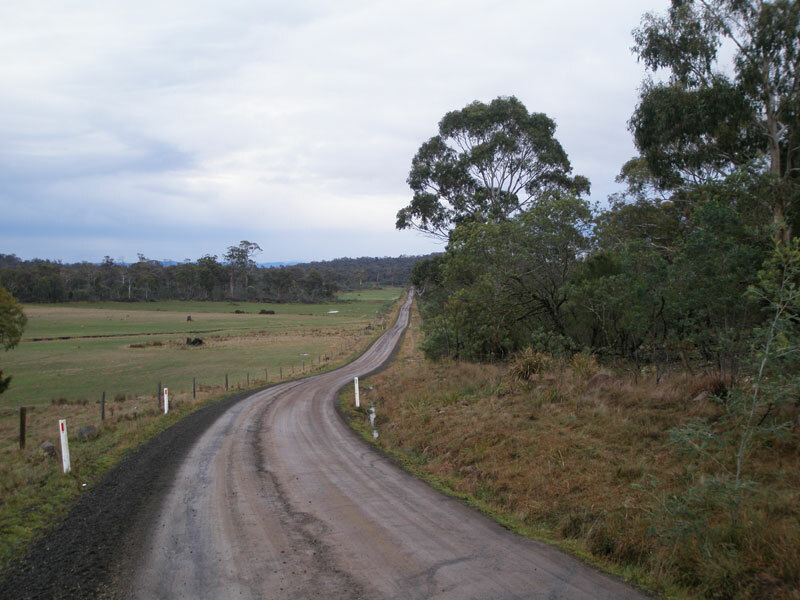 Route C414 is a minor rural connecting route in the upper North Esk Valley, linking C401 (Blessington Main Rd ) with C413 (Evandale-Blessington). It is unsealed throughout its short length. 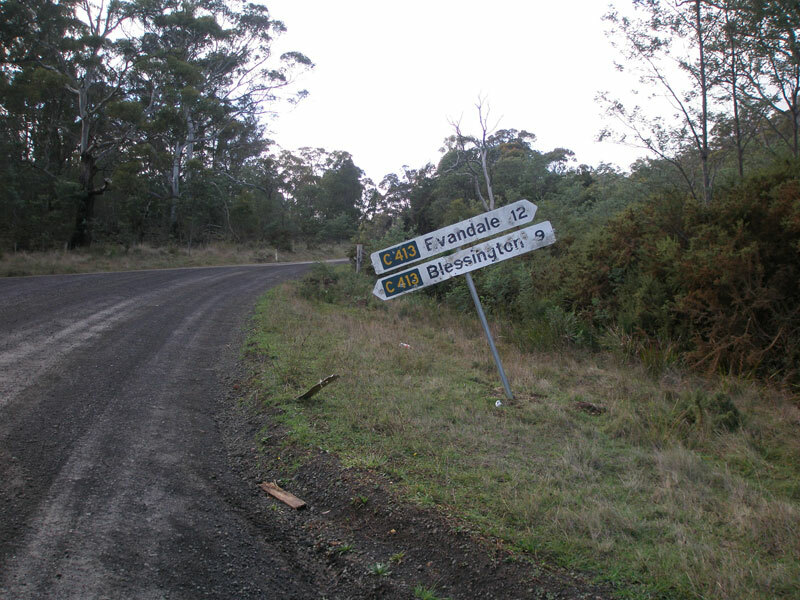 When Peter Renshaw first visited C414 in May 2007, he found the route has gone missing - there was not a single C414 sign to be seen along its entire length. 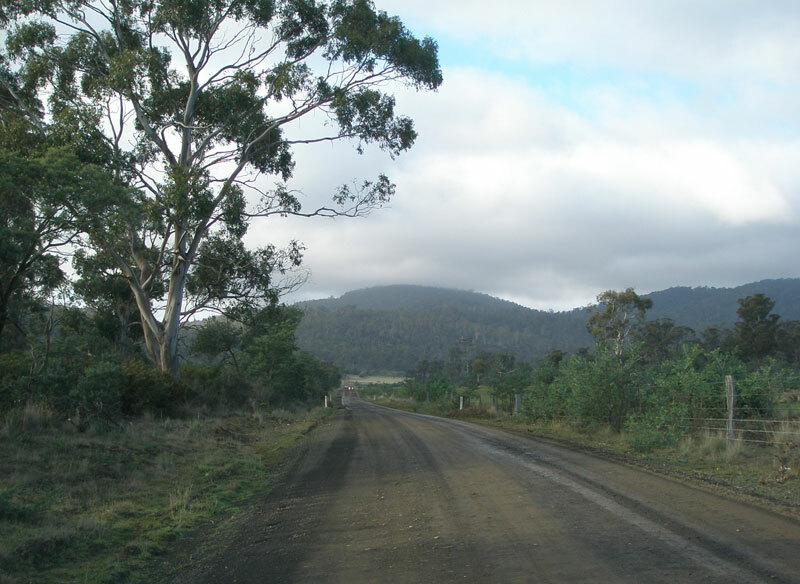 Ozroads alerted the Department of Infrastructure, Energy and Resources (DIER) to the missing signs and when Peter returned in July, he found this brand-spanking new C414 fingerboard. 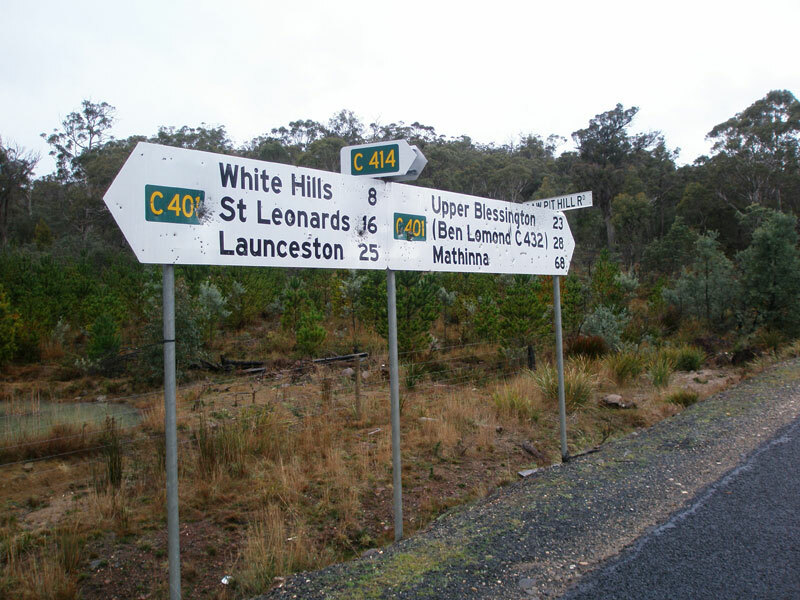 Launceston City Council have not yet reinstated signage along the remainder of the route. So, for now, C414 is a one-hit wonder. 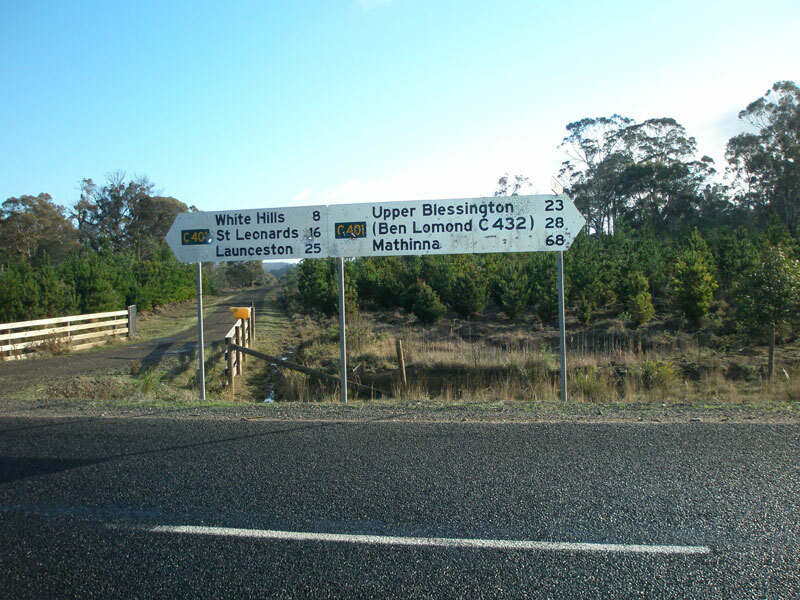 Fingerboard signs at the junction of Blessington Main Rd (C401) & Forest Rd (C414), 8km east of White Hills. The top photo was taken in May 2007 when no C414 signage was in existence, and the bottom photo shows the reinstated C414 signage in July 2007. Forest Rd (C414) looking south from Blessington Main Rd (C401). Forest Rd (C414) looking north from Logan Rd/Sawpit Hill Rd (C413). Council-installed sign pointing down Forest Rd (C414) from Logan Rd/Sawpit Hill Rd (C413), giving the incorrect indication that it is the Blessington Main Rd (it leads to Blessington Main Rd). Note no mention of C414. Fingerboard signs at the junction of Logan Rd/Sawpit Hill Rd (C413) & Forest Rd (C414) - again no mention of C414.